There must have been a time when nobody knew how to count. Hardly anyone gives it a second look, other than the few hard-core philatelic connoisseurs who use it to document the tedious ebbs and flows of postage stamp production cycles behind the closed doors of security printers. After all, few things would appear more mundane than a number in a circle, something with which your mom would itemize a shopping list scribbled on scrap paper. It was hence to the author's delight that, on a lazy afternoon, he began to see what was in plain sight all along—a masterpiece of typography and design, thought through to the last detail and manufactured with an exquisiteness possible only with the touch of a human hand. 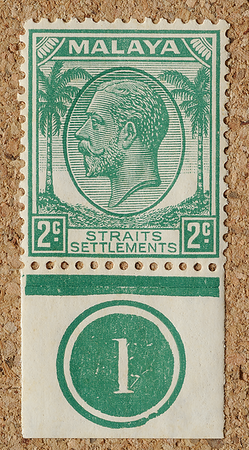 The plate number, in the eyes of the author, attained its zenith in the trademark circular design that London's De La Rue used across the British Commonwealth from Antigua to Zululand, exemplified here on the sheet margins of the coconut definitive. The number is rendered light-on-dark for good reason. 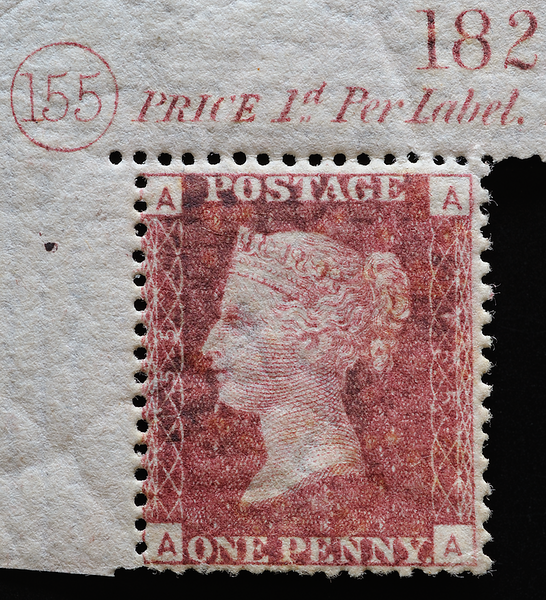 The generous blob of colour makes it not only easier to see against the white background but also easier to tell from the colour of the ink whether it is the head- or duty-plate number, especially when the two are of similar shades. 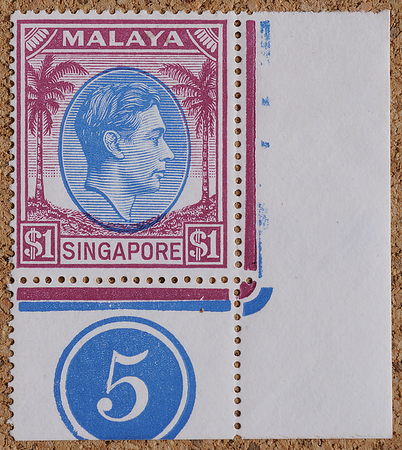 The area of contiguous ink on the plate number slug is larger than any on the stamp itself. In London, however, De La Rue did something that had never or rarely been done with enclosed alphanumerics in print. They made it three-dimensional. The inked and uninked concentric rims of the De La Rue design give the circle a bold and elegant boundary with an emboss effect, making it easier to find along the margins of the sheet where it facilitates quality control and defect tracing. 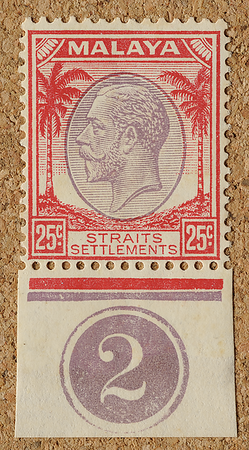 The design goes back as far as the 1860s, for example in the Straits Settlements (see Wood 1948). 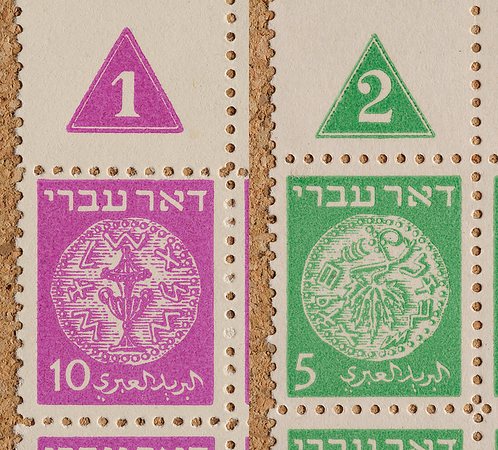 A similar design featuring triangles instead of circles appeared on the sheets of Israel's first stamp issue in 1948. It might have been inspired by the Star of David which consists of two overlapping equilateral triangles. 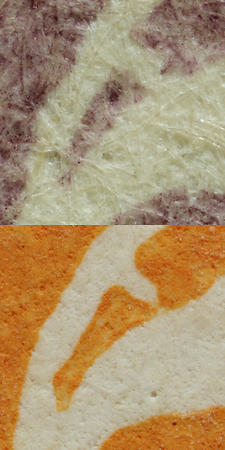 Alas, the narrow borders weaken the emboss effect. 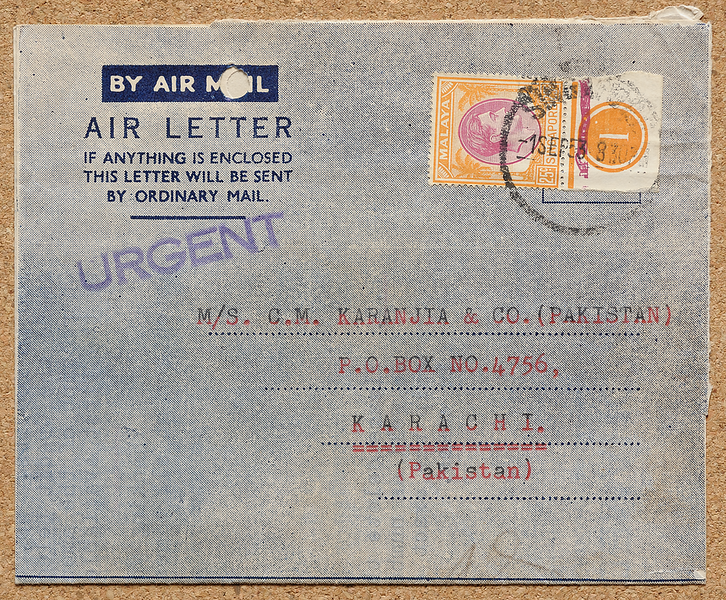 When a De La Rue circular plate number goes on an envelope, it turns heads with an air of authority and priority. Circled numbers, like charged subatomic particles, exert on the eye a kind of fundamental attractive force. But most printers around the world settled for "naked" plate numbers, the numbers being no more than an administrative and logistical requirement that usually served little purpose before getting discarded with the margins after the stamps had been sold. Even De La Rue eventually succumbed to the trend. 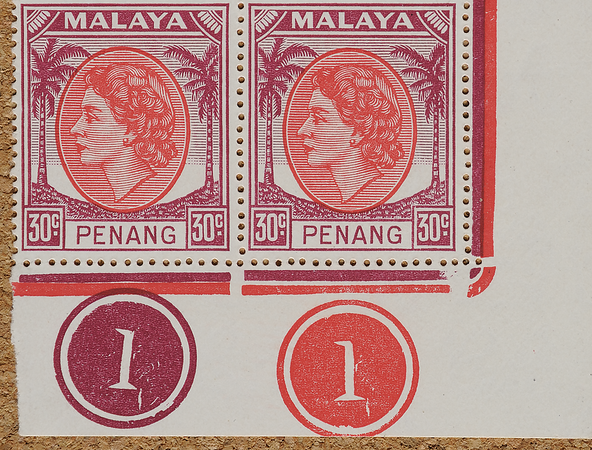 While they were at it, however, De La Rue carved out a set of typographical jewels that would stand the test of time. The numerals, engraved in circular crucibles of creativity, exhibit the extreme thick-thin stroke contrast that characterizes the late-18th-century Didone style, which Pohlen (2015) describes as having a "sparkling" quality and deems amenable to a large font size and lots of white space—exactly the environment in which the plate numbers reside on the sheet. 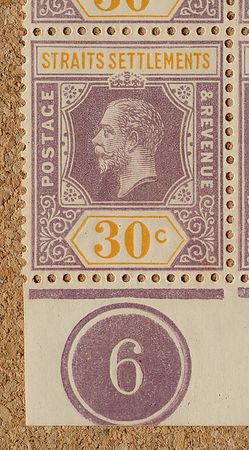 The De La Rue typecutters took subtle stylistic detours with a mix of Didone, bracketed and wedge serifs; see illustrations throughout. 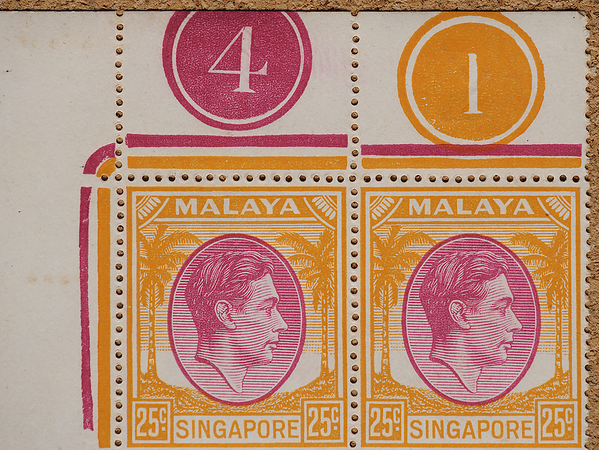 Before 1939, not all printing plates bore plate numbers. Then the keeper of the Royal Philatelic Collection asked for numbers to be put on every plate so that he could be sure of getting a complete collection of stamps from all plates (Vousden 1997). 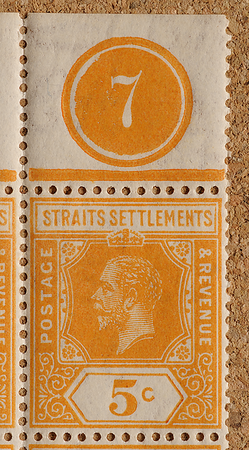 Much has been written about plate varieties and plate flaws in stamps, but almost nothing about such things in the plate numbers. 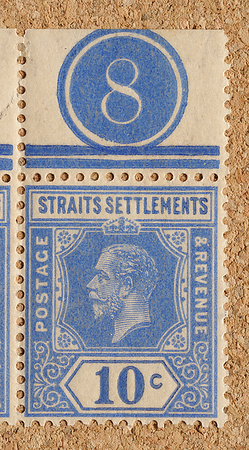 For example, the plate numbers of Straits Settlements KGV and KGVI coconut definitives show the same scratches and deformations in the circle, suggesting that the plate-number die was shared across plates. The author was pleased if not surprised to see the same flaws in the plate number on a corner block of a Kenya-Uganda-Tanganyika issue. The humble plate number was probably electrotyped onto the plate as was the stamp design, using a die of the appropriate numeral of which several copies were available like the movable type used in letterpress printing. In the world of handcut type, there can be subtle typographical variations across specimens of a given numeral. 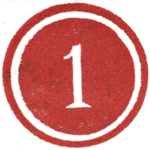 Of particular interest is the number 1, which despite being the simplest of the numerals comes with several styles of serif: the uniformly thin Didone-style serif, and wedge serifs angled in different ways. The example at far left is missing the serif at the apex, while the one at far right is a rare form with a curiously kinked apical serif that not only is un-Didonelike but also does not match the style of the wedge serif at the base. Overall, the differences are small but typographically significant, an indication that the multiple dies were cut by different employees. Despite this, all of the above have a slight dent on the upper right part of the inner circle, which suggests that the circles might have been carved using the same guiding template. 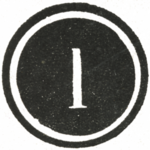 That there were probably many more different 1's than other numerals isn't surprising, since in the coconut definitive a different duty plate was needed for each denomination of each of the 12 states. 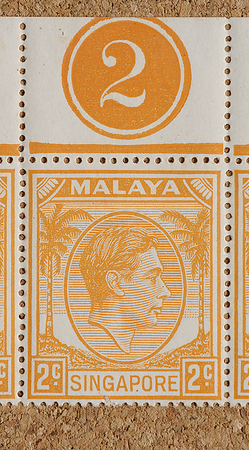 According to data from Stanway (2009), the vast majority of coconut key plates and duty plates never went beyond 1, such as the Kelantan 20 cents above. The plate makers overlooked one detail: the number slug of the duty plate (green in this case) was positioned right next to the plate's jubilee line, leaving insufficient clearance for the outer jubilee line (black in this case), resulting in an overlap of the duty plate number and head plate jubilee line (further examples below). 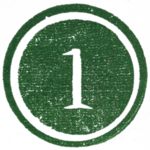 The numeral is not always perfectly vertical, indicating that a rotatable slug was used somewhere along the assembly line. Here the head-plate and duty-plate numbers were made from the same die judging from their similar flaws, but the 1 on the left has a more steeply angled serif at lower right and an apex with a sharper upper right corner. The most plausible explanation in the mind of the author is that the die was first used in the construction of the head plate, and subsequently touched up by an engraver before being used for the 30-cent duty plate. By then the die had also accumulated more scratches. 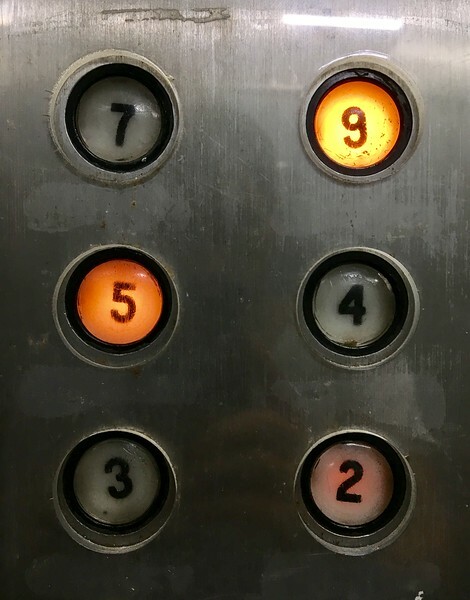 Rotatability of circles as seen in lift buttons in the Wedge Mount Industrial Building in Singapore, where the 9 is actually 6. Perhaps this explains the predominance of square lift buttons today, which cannot rotate. The numeral 2 is embellished with a pronounced "dewdrop" at the end of the overhang, a Didone characteristic not unlike the clefs of musical notation; and both its oblique stem and horizontal foot are gracefully curved, a double embellishment uncommon among typefaces and majestically carved out at large point size. 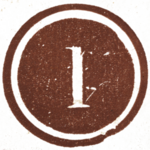 The two plates above were used more than a decade apart, with World War II in between, but both used the same slug for the numeral 2 sporting a scratch inside its lower left corner (magnified views, right). More Didonesque dewdrops in 3. 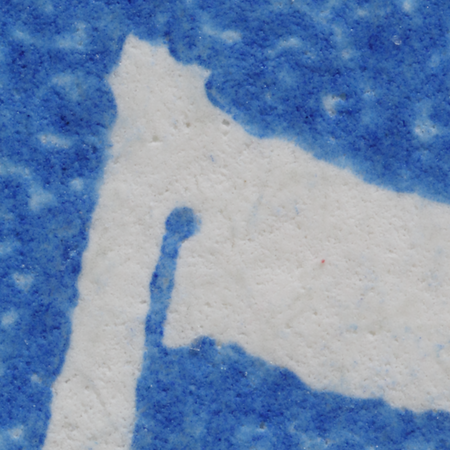 The printing surface of the plate number appears to have suffered impacts with a hard object. The same flaws are seen below. 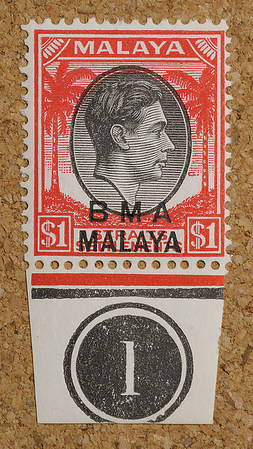 These flaws were present as early as the BMA printings of 1945 (author's observation). 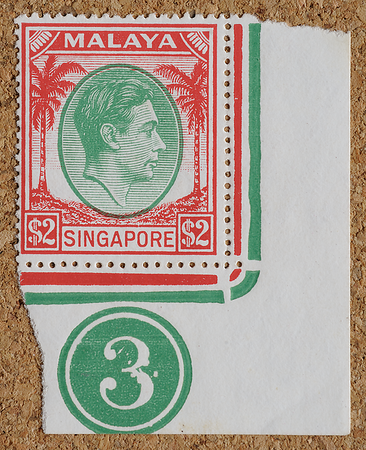 The $2 with head plate 3 is the rarest Die I plate-denomination configuration of the Singapore coconut definitive, with only 1000 sheets ever printed. 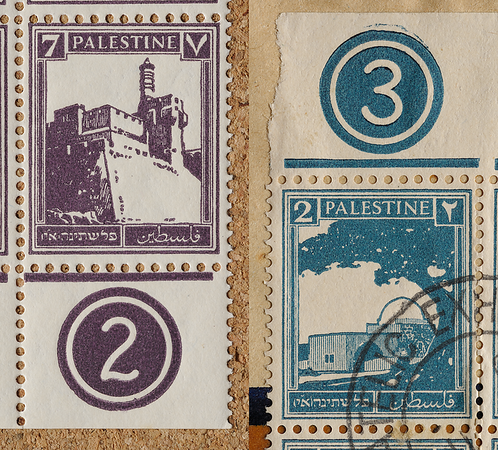 The readable but less elegant "felt-marker" numerals—with appropriately rounded stroke-ends—of pre-World War II Palestine issues. A serif on the horizontal stroke of 4 is rarely found in any class of typeface, let alone a bold and curvaceous bracketed serif, which gives the plate number a regal character. 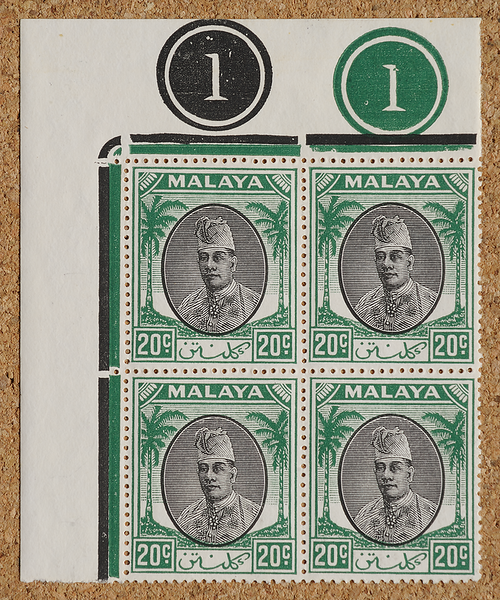 Other than this KGVI head plate, the only other instance in which a coconut definitive denomination reached a plate 4 was the single working plate of the highly used 10 cents of the prolonged Johore issue, which continued to be printed until 1959 because the long-lived and influential Sultan Ibrahim did not like the definitive design that was to succeed it. The 5 is impeccably balanced on both horizontal and vertical axes with its delectable bulbousness and a subtle hint of italicization. 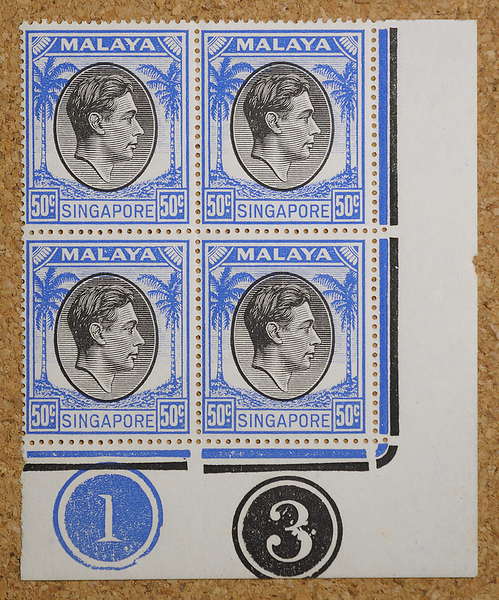 In the coconut definitive, only the KGVI head plate reached number 5, which was only ever used for Singapore. It was the culmination of a long 15 years of KGVI head plates beginning in 1937, persevering through BMA and lasting until at least the end of 1954, more than a year after Queen Elizabeth II had ascended the throne. 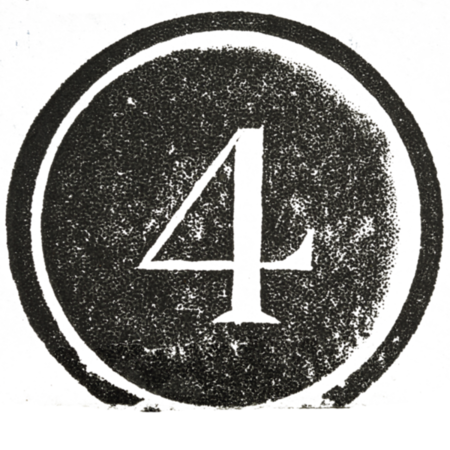 A thin, slightly bent intrusion of ink extends upwards from the vertical stem partway into the root of the horizontal stroke of the 5. It suggests that the number was first cut as a protruding impression on a mould by removing the surrounding material, the type designer ensuring a crisp intersection of edges by cutting slightly past the intersection. The mould was then electrotyped into a recessed impression on the final printing plate. This is a truncation of the three-step process for the stamps themselves, whose design was first engraved as a master die that could be used to print die proofs, before being transferred to a mould for electrotyping. Beyond digit 5, one enters Imperium territory. Although 6 and 9 are simply upside-down of each other and could have shared rotatable slugs, separate dies were cut, with subtle differences in edge curvatures. It seems that the slugs were not used interchangeably, judging from the author's examination of several instances of each plate number across different issues. One of the most asymmetric and angular numerals, and one of the most symmetric and curvaceous—7 and 8 could not be more different from each other. Mathematically, 7 is a prime number in the fullest sense: a double Mersenne prime, Newman-Shanks-Williams prime, Woodall prime, factorial prime, lucky prime, happy prime and safe prime. It has a special place in cultures all over the world, from Britain's agent 007 to the hungry Chinese ghosts roaming the earth during the 7th month of the lunar calendar. Meanwhile, 8 is a perfect cube and a Fibonacci number and has a gorgeous hourglass figure. Double-digit numbers, cut to fit in circles of the same size, deviate typographically from the standalone numerals, such as in more compact serifs and finer strokes. The digit 3 is so exquisitely chiseled as to remind the author of a histological specimen on a microscope slide. 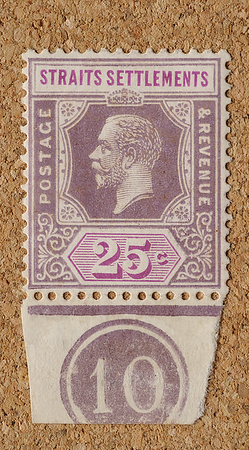 There were 28 head plates of King George V in the Imperium series, which is hardly surprising given that stamps of more than 20 British territories around the globe were using the same head plate. Limited space in the circle has somewhat constrained the typographical expressiveness of the digits compared with their standalone forms. 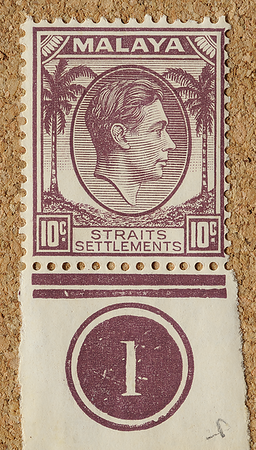 See Wood (1948) for a detailed account of Straits Settlements plate numbers. 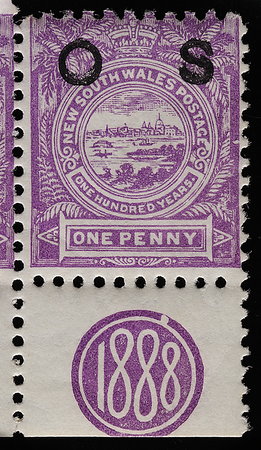 Even the Imperium plates are eclipsed by those of the fiscal version of Britain's long-lived Penny Lilac, which reached three digits. 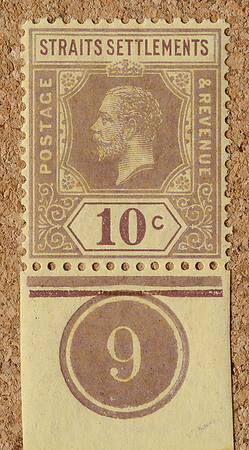 Plate 121 was put to press at De La Rue in 1878. 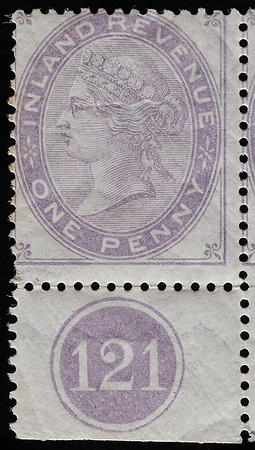 Enclosed four-digit numbers are known in sheet margins, but they denote the year of printing rather than the plate number. Here the engravers at the local Australian printer may have been inspired by the concentric circles of De La Rue. Nevertheless they pushed typographic boundaries, creating a festive, eye-catching motif not inappropriate for the centenary of the colony of New South Wales. 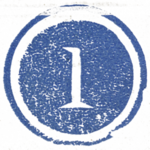 A white number on a dark ground would not work well with recess printing, since it would be difficult to separate a large patch of ink from the depression in an intaglio plate and deposit the ink evenly on the paper. 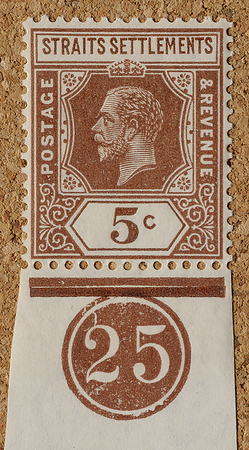 On this rare surviving sheet margin of the recess-printed Penny Red (plate 155, c. 1875), printers Perkins, Bacon & Co. opted for lightweight digits within the confines of the circle but managed to incorporate some of the typographical flourishes earlier described of the De La Rue numerals. 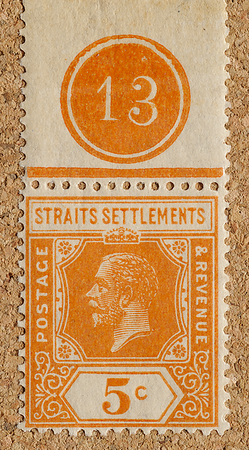 Indeed, the typographic style of the sheet's current number 182 is very similar to that in De La Rue's plate numbers. The rest of the marginal inscriptions above reveal more of the Didonesque typeface. The numerals we use in modern times for everything, from plate numbers to grocery shopping to rocket science, were actually invented by scholars in ancient India. Indian scholars, unlike the Greeks, placed more emphasis on practical applications. They were motivated not only by the number but also by calculation (Ifrah 1998). But the rationale behind the glyph shapes is a mystery not enlightened by various hypotheses such as those based on the number of angles, number of lines or other geometric bases, which Ifrah (1998) regards as flawed. Nevertheless, the so-called Hindu-Arabic numeral system spread to Arabia and subsequently to mediaeval Europe. Around 1840, a typeface emerged in the Chiswick Press of Birmingham, whose numerals appear to be a stylistic precursor to the plate numbers. The typeface was digitally revived in 2000 by Günter Gerhard Lange and Dieter Hofrichter as Whittingham (above), after the founder of the Chiswick Press. Notably, Whittingham—and most other typefaces—does not have the splendid serif that so distinguishes De La Rue's 4. By the time the Chiswick Press closed down in 1962, the last of the coconut definitives were being issued, and the world was bidding farewell to letterpress and the iconic circular plate numbers. Yet in the author's eyes, the plate numbers are more than relics from a lost era. Looking not unlike medicinal pills, they are the author's remedy for the overdose of word processing and mass-produced fonts—a timeless elixir of man's endangered artistic protoplasm.